At precisely 2:30 p.m., a whistle blows and the selling is on: a rope that separated sellers from buyers falls away, and buyers — mostly restaurant owners or brokers who buy here and resell — and onlookers lean in to look closer at the black truffles sitting on benches in weathered baskets with red-and-white cloths. If you ask a seller a question, he may casually ask you to move on so real buyers can get a look at his wares and bargain with him. He’s not there to socialize, but for the high prices his truffles invariably bring in when he connects with the right buyer. 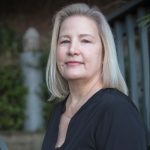 Although the market originated as a place for restaurant and other commercial buyers to purchase truffles, these days, some household consumers can be found, usually leaving the market clutching a few small truffles in plastic bags. 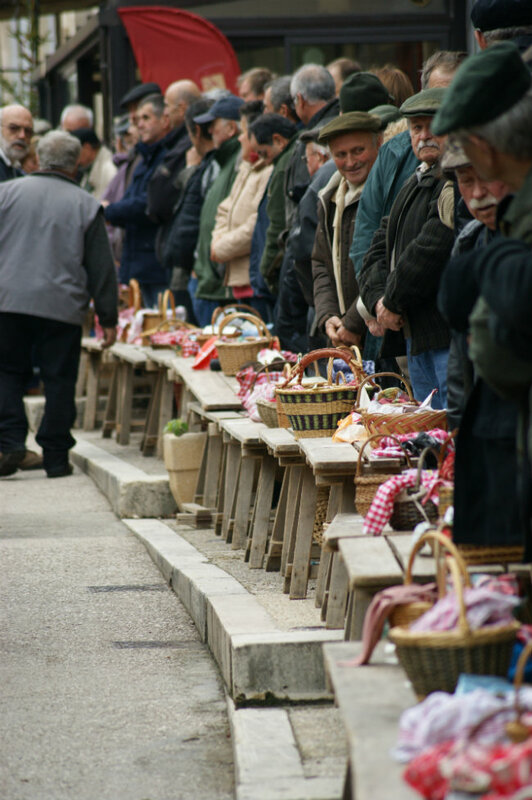 At Lalbenque, the largest and one of the most well-known truffle markets in southwest France, the truffle sellers are local. Rumors are whispered about the occasional Chinese truffle finding its way to the market, but Alain Ambialet, president of the Truffle Producers of the Lot department, says selling is only allowed by those who can prove with documentations their own identification and the provenance of their truffles. Ambialet says vendors number from 50 to 150 on most market days and most are local landowners. Next to the market, restaurants offer multi-course meals with truffles as their centerpieces. The mushroom makes its way into each of the courses from entree to dessert. At one outdoor table, gratis samples of truffle panna cotta are given out. The day’s market ends when the last truffles are gone, sometimes a mere 15-30 minutes after it opens. 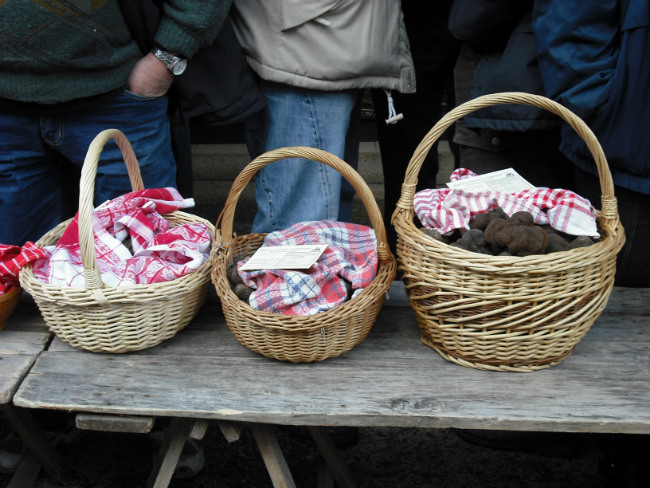 Also for sale at stalls are green oak saplings, under which the truffles grow, baskets for hunting, and local sausages. Ambialet reported three tons of truffles were sold at the market in Lalbenque last year during the season, which opens on the first Tuesday of December and ends in the middle of March. Some 1.7 tons once sold in a single day. About 40 percent make it outside France to such places as the U.K. and Belgium, with an increasing number going to Asia. For those interested in truffle hunting, a true adventure awaits you at Domaine de Saint-Gery in Lascabanes, about 30 minutes’ drive from Lalbenque. The farm is close to self-sufficient, with a genteel country design for its restaurant and rooms, gourmet food and down-to-earth philosophy. Proprietors Patrick and Pascale Duler make almost everything themselves — the cuisine revolves around the Domaine’s truffles, Black Gascon pork, foie gras, vegetables and fresh herbs from the kitchen garden. They grow flowers, sprouted seeds, wild salads and the wheat from which the bread is baked. The 30-acre truffle farm is located on the couple’s 175-acre farm, a 15-minute walk from the elegant guest house with five rooms and suites, pool, fitness room, small boutique, food shop, private dining room and a soon-to-be winery facility. 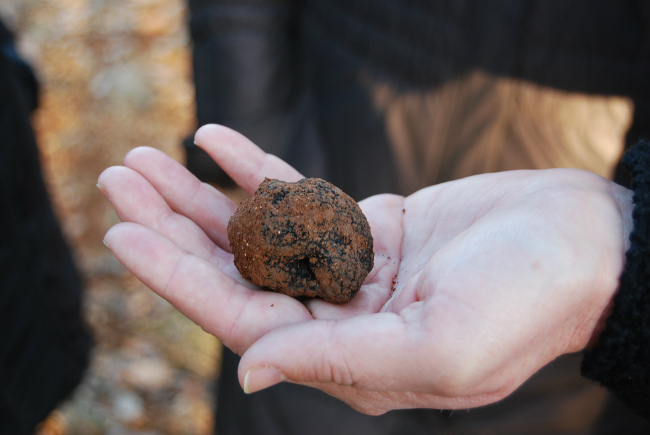 Chef Patrick Duler includes the organic farm’s truffles in his offerings — made up daily, there is no menu — and Pascale, his wife, will take you on a tour of the truffle farm with one of several truffle-hunting dogs. 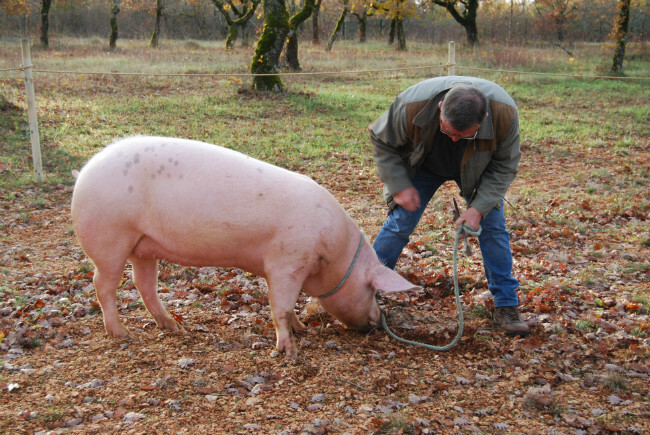 Pigs used to be used for ferreting out the underground fungi but they had a propensity to eat what they found. A dog’s keen sense of smell locates the truffles, but it is not tempted to ingest them. Pascale’s dogs are more interested in the treats of lard she gives them after they nose out a truffle from the ground. The French believe that almost any dog can be trained as a truffle dog if they are motivated by food, toys or, Pascale says, pleasing their owners. When you dig them up, truffles don’t look appealing or like anything you’d want to eat, let alone one of the most coveted foodstuffs in the world. They’re dirty and gnarly, so indistinguishable from the dirt clods and rocks in the soil around them that they are hard to spot. 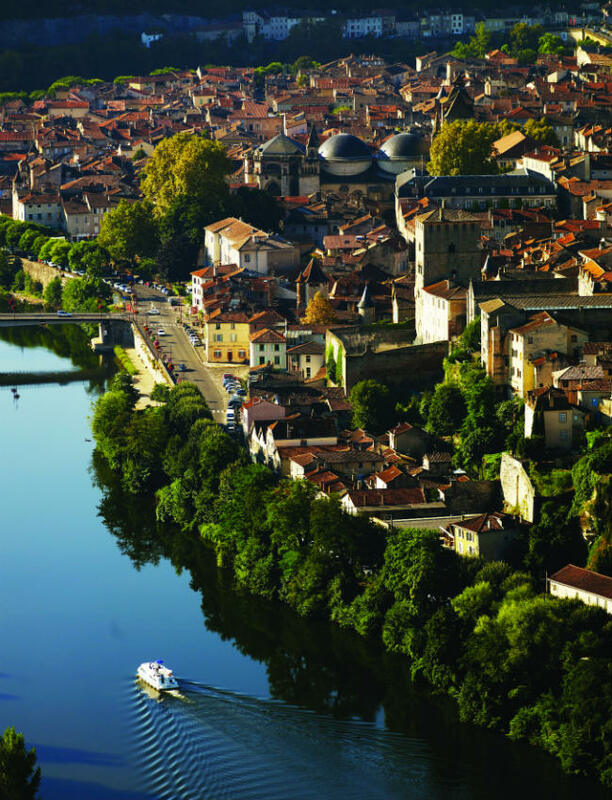 In the late 1800s, phylloxera devastated vineyards around the Quercy region, especially in Cahors, where its celebrated Malbec wines were imbibed by royalty and the highest-ranked statesmen. This was an opportunity for planting the oak trees under which truffles are cultivated because the limestone and chalky soils of the region that were good for vines were also desirable for truffle cultivation. But as wars and industrialization set in, much of the truffle land was lost to other purposes. This is why truffles are considered such a rare delicacy today. 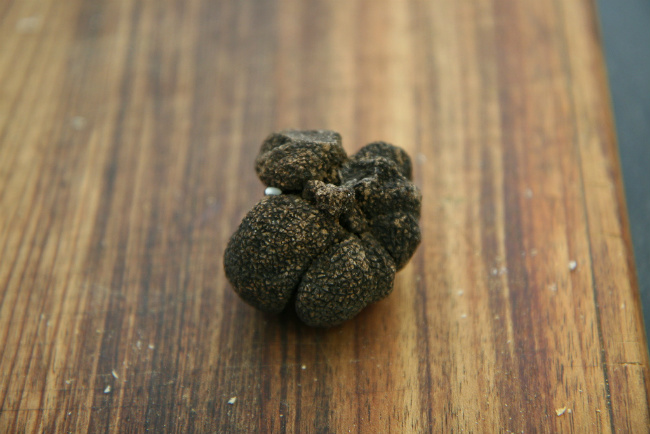 Lalbenque’s truffle market is busiest in January to mid-February when the truffles are riper than in December. Visitors are welcome, says Ambialet, and can even seek guidance from the association of truffle producers if arranged in advance. 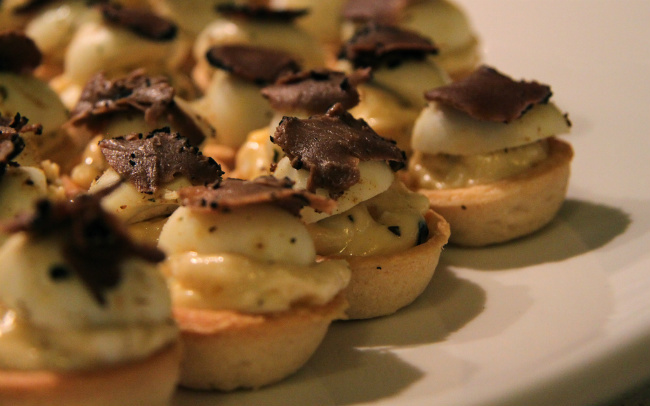 The Lalbenque Fête de la Truffe takes place January 26-27 this year with traditional events like formal truffle meals, a digging contest, wholesale and retail truffle markets, local and regional produce stands, a village of artisans, a culinary workshop, conferences, truffle and champagne tapas bars with snacks infused with truffles. For more information and reservations: +33 (0) 6 83 62 34 00. For truffle tours and hunting adventures, see www.lalbenque.net and www.tourisme-lot.com.